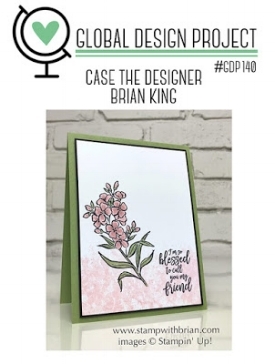 The Global Design Project Challenge this week is to Case The Designer, and this time the designer is Brian King. Brian is a demonstrator in Atlanta and I have followed him for a while. His cards are clean and interesting, and I love his designs. He inspires me with lots of his designs, and today I am 'case'ing this card of his. He has used a friendship sentiment, a floral focal point, and has added some design stamping near the bottom of his card. I also used a friendship sentiment, a floral focal point, and some new Designer Series paper for the bottom design. I love his card, so I'm caseing most of it for mine! I used Stampin' Write markers in Tranquil Tide and the new In Colour Grapefruit Grove to colour directly on my stamp from the Artistically Asian stamp set. This set has marvellous images and some beautiful sentiments - a perfect stamp set. The Designer Series Paper is from the new Nature's Poem DSP available starting June 1. TIP - When you are using markers to colour on your stamp, start with the lightest colour, and move to the darker colour(s). This way if you colour outside the lines, you won't get dark ink on your light marker. Also remember to 'huff' on your stamp after you colour it, before you stamp your image. Have fun with this easy, but very effective technique. I love when the new catalogue comes out with fresh new products. Adding some of these, in my case the DSP and Grapefruit Grove colour to items that I already have in my stash makes everything new and exciting all over again. Get your wish list ready, June first will be here soon!